You’ve started to plan your wedding, and now you’re thinking about your honeymoon. It’s a time to celebrate being married and ease off the stress of planning a big wedding! To help you pack for your honeymoon, I’ve put together some of my favourite Canada and Toronto-based designers and products to help you get ready. Keep reading for my tips on honeymoon packing. Take this opportunity to get something uniquely you and custom-made for your once in a lifetime trip. There are so many options when it comes to going custom and if you’re heading to a beach locale, a custom-made bikini is a must! Unika is a Toronto-based custom swimwear company, with options for women of all shapes and sizes. Just like creating a custom dress, they will custom create a bikini to your liking, including the cheekyness of the bottoms, the thickness of the straps and the type of padding you like. They tailor the bikini to fit your body shape and preferences, with lots of fabric choices. Arrive to your destination in style with a neatly packed suitcase. 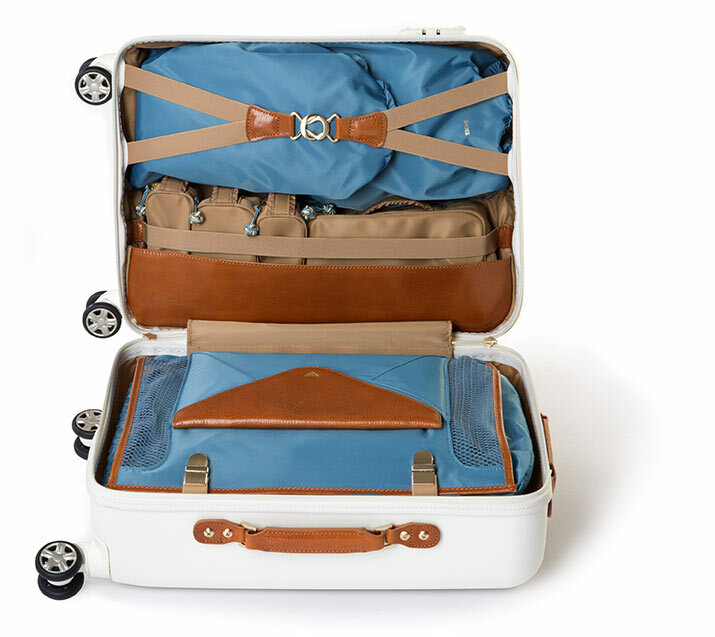 This Quarter Master from EbbyRane comes with 10 carryall bags and a matching clutch. All of them neatly pack into the suitcase, allowing you to carrying all your essentials as a carry-on without having to check in your bags. It also looks beautiful! Quarter Master in Cloud White by EbbyRane. Bring a beautiful and light-weight tote bag for your travels. I always love a tote that has a couple handle options, for when we want to throw it over our shoulders and shop. A beautiful robe and shoes are so important on a wedding day, so I’ve included in this list as well. You can get double duty on your bridal robe and shoes on your honeymoon! Consider getting a pair of beautiful sandals that you can wear for late night dancing, that you can also wear for travels. Seen here are the Hera Pearl Silver sandals from Bella Belle Shoes. Bridal robes are still all the rage for getting ready photos. This lace robe would look just as beautiful while sitting on your hotel patio sipping coffee. This is your honeymoon afterall! Pick up something a little naughty for your new hubby-to-be from The Nookie. They have an amazing selection of lingerie and toys, with more unique finds than you might find at the mall. Whether you’re going to a beach destination or a European adventure, take this opportunity to pick up some beautiful accessories that are uniquely you that celebrate your first trip as husband and wife!